Home theater systems are not seen as only luxury items anymore – they are a necessity that transforms your home into the oasis of entertainment and relaxation you’ve earned. The benefits are enormous. Not only will your house value increase, but you will also personally enjoy the many opportunities that come with your very own home theater installation. Romantic dates will have their own setting in which to cuddle while watching their favorite rom-com. Nights of watching action-packed adventure and horror movies will be elevated and make you feel like you are inside the film. With the right sound system, the rest of your life will fade away as the movie takes over all of your senses. Invite your friends over to enjoy seamless graphics and a new dimension of sound. Of course, it’s not just about movies – we can’t forget to mention game nights. Hook up your gaming system and get social with your competitors. Sure, you may need professionals to hook up all the gear… But it will absolutely give you that ‘’wow’’ game theater experience that your guests won’t forget. You know you can count on us to deliver the private screen party you’ve always dreamed of. What are the most important perks of having the professionals set you up? Home theater systems are amazing for… Decluttering! No more cables everywhere. You can reduce the clutter of utilized equipment with our help. Cables coming out of electronics leaves an impression of constant mess and ruin the aesthetic of your sleek screen and entertainment system. Why have the best of the best if it’s just going to look sloppy? Leave that boring part to the professionals – we will be careful not to ruin your impressive interior design. While we may not be the masters of your style, we are experts on providing excellence in product knowledge and package installation. We will safely store your equipment. Before leaving, we will troubleshoot connectivity between each piece of equipment. Then, tidy up cords and cables, and return the space to how we found it in every way. We are here to make things simpler and more effective. Trust the professionals. When it comes to home theater systems, location plays a major role every time. Our team of experts can work with you to find the perfect oasis in your home for your personalized home theatre setup. An ideal place should be isolated from the rest of the home, so as not to disturb the other areas while also providing a sense of privacy to those in the home theatre. In perfect world scenarios, we only need an area of space that is 20 feet long by 13 feet wide with high ceilings. But don’t worry, that’s where our experts come into play. Our installation experts can assist you in making the most of your home space, large or small. They can maximize the opportunities within your home and use them to your advantage. While we love to transform basements and attics into luxury home theaters, you can easily adapt a spare room into a fun zone or convert a new one, if your budget allows. For the most authentic environment, use movie theater lighting to create a beautiful cinematic atmosphere. Also, make the most of your acoustics – an audio system is one of the most important components in creating your atmospheric effect. It will help you isolate outside noises and harness your home theatre soundscape into the transcendent experience. Imagine all that is possible! It is the perfect treat for moviegoers and video game junkies. We can help you simplify your controls based on your personal preferences. We will connect everything and program one universal remote controller for you. Just sit down and relax because, with us, you will have everything in control and just one button away. 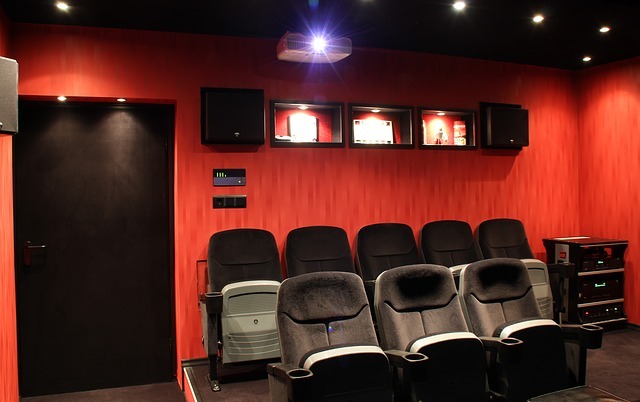 If you want to find out more about home theater products and installations, we are your team. Contact us right away!